Late last year we started a process for moving ccMixter.org, the remix community we launched November 2004, to an entity or person(s) that could take the community to the next (several) levels. trend setting web destination … which has become the premier on-line artist’s village for music makers from around the world, who sample, cut-up, share and remix each other’s music legally, creatively and joyfully. This description is corroborated by the quality of artists drawn to collaborate with the ccMixter community and the receptivity of that community, which has remixed nearly 80% of uploaded a cappellas. The software that runs the site is also award winning. 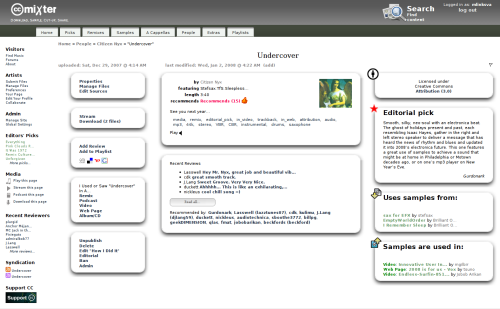 If you aren’t familiar with ccMixter, or hadn’t realized how cool it is, go visit the site, then return here. The process of finding a new home for ccMixter included a survey of the ccMixter community. Results of the survey are presented at the end of this post. Commitment and ability to conform to principles described in guidelines [at http://lessig.org/blog/2007/11/ccmixter_thinking_about_where.html]. Scale and impact of success (taking into account web site growth plans and other marketing and promotional plans). Amount and terms of financial compensation to CC. Understanding of and sensitivity to the needs of open sharing communities. Understanding of and compatibility with Creative Commons’ mission. We’re eager to see what the ccMixter can become — and confident it will be amazing. If the above sounds like your company or organization, please read the RFP and respond. Which other CC-enabled music remix sites have you tried? Just to say: I wonder if there are other things that ccMixter could be besides purely non-profit or commercial. Here in the UK we have CIO, CIC which are community based entities that you can run a business under or as partially non-profit with a profit making end etc. So maybe this model would suit better? Also I wonder what provoked the decision to make this move, rising costs? Proposals from non-profit, for-profit, hybrid or other organizations as well as individuals are welcome. The costs of running ccMixter have been pretty stable for a long time. If the site were to really take off those costs would increase. We want the site to flourish and understand that running a music site is not CC’s core competency, nor could we bear the cost of running a hugely popular music site (even if we could financially, it would be a strain in terms of organizational focus). So in a very roundabout way, future rising costs contributed to the decision. The results are really interesting. Could you provide more information of the survey and results? The survey started 2007-11-14 and ran for a couple weeks. If there’s research interest I might be able to get a database dump of the survey with any personally identifying information scrubbed. The survey is very interesting. Did the survey run on CCmixter? I think CCmixter (and CC) is a revolutionary idea. The CC model has worked well, and it might be interesting to channel the CCmixter community music to make some money for the CC artists. Perpahs some kind of gift economy would be cool, where if artist are contributing to the CC body of music, then they can get it for free. If not, they would have to pay for it, so the CC artists can make a little money. Another question–is the acquisition of CCmixter a paper acquisition? Or, will somebody have to pay some money for it upfront? Yes, the survey was run on ccMixter. Only registered users could participate. The acquisition could involve cash (all else equal of course more cash is better and some better than none), but we’re looking at a whole set of factors — that’s why we’re doing a Request For Proposals rather than a Request For Bids. See the RFP. we all know anyone putting up money will want a fair return on that money, usually people (investors) are not interested in the produce much but just getting a return – which is fair enough, but it could ruin (most probably change) the site dynamics. I think the best course of action is for the members, those who have been active members to be given the option to buy a share in this business at least. I have an idea for a business model, its a standard approach but its pretty revolutionary for internet business, but it could be a fair model for user ownership. I understand that decisions will require more time but I was wondering if we could get an update. It’s been quite some time since we’ve heard anything.